For Australian footballer, see Jack Pickford (footballer). 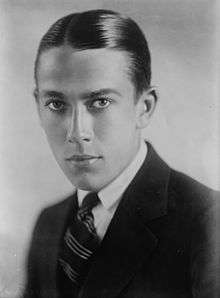 Jack Pickford (born John Charles Smith; August 18, 1896 – January 3, 1933) was a Canadian-born American actor, film director and producer. He was the younger brother of actresses Mary and Lottie Pickford. After their father deserted the family, all three Pickford children began working as child actors on the stage. Mary Pickford later became a highly popular silent film actress, producer and early Hollywood pioneer. While Jack also appeared in numerous films as the "All American boy next door" and was a fairly popular performer, his popularity never matched that of his sister's as his off screen antics overshadowed his career. By the late 1920s, his career had begun to decline due to his penchant for partying and frequent use of drugs and alcohol. In 1933, Pickford died in Paris of progressive multiple neuritis, aged thirty-six. He was born John Charles Smith in 1896 in Toronto, Ontario, to John Charles Smith, an English immigrant odd-job man of Methodist background, and Charlotte Hennessy Smith, who was Irish Catholic. He was called Jack as a child. His alcoholic father left the family while Pickford was a young child. This incident left the family impoverished. Out of desperation, Charlotte allowed Jack and his two sisters Gladys and Lottie to appear onstage, beginning with Gladys, the eldest. This proved a good source of income and, by 1900, the family had relocated to New York City and the children were acting in plays across the United States. Due to the work the family was constantly separated until 1910 when Gladys signed with Biograph Studios. By that time his sister 'Gladys Smith' had been transformed into Mary Pickford (Marie was her middle name, and Pickford an old family name). Following suit, the Smiths changed their stage names to 'Pickford'. Soon after signing with Biograph, Mary secured jobs for all the family, including the then-fourteen-year-old Jack. When the Biograph Company headed West to Hollywood, only Mary was to go, until Jack pleaded to join the company as well. Much to Mary's protest, Charlotte threw him on the train as it left the station. The company arrived in Hollywood, where Jack acted in bit parts during the stay. Mary soon became a well-known star, and by 1917 had signed a contract for $1 million with First National Pictures. As part of her contract, Mary saw to it that her family was brought along, giving the now-named "Jack Pickford" a lucrative contract with the company as well. Screen shot from the 1916 film Seventeen by Robert G. Vignola. By the time he signed with First National, Pickford had played bit parts in 95 shorts and films. Though Pickford was considered a good actor, he was seen as someone who never lived up to his potential. In 1917 he starred in one of his first major roles as "Pip" in the adaptation of Charles Dickens' Great Expectations, as well as the title role in Mark Twain's Tom Sawyer. During World War I, Pickford served a stint in the Navy; afterward he returned to making films. By 1923, his roles had gone from several a year to one. In 1928, he finished his last film, acting as Clyde Baxter in Gang War. Through the years he dabbled in writing and directing; however, he never pursued either form further. Most of his films were considered B movies, though he was able to make a name for himself. 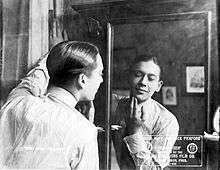 Pickford's image was that of the All-American boy. Despite his "boy next door" image, Pickford's private life was one of drinking and drug abuse, and womanizing, culminating in the severe alcoholism that resulted in his early death. In the early days of Hollywood, movie studios were able to cover up almost all of their stars' misbehavior, but within the Hollywood crowd, Jack Pickford's behind-the scenes activities made him a legend in his own time. In early 1918, after the United States entered World War I, Pickford joined the United States Navy. Using the famous Pickford name, he soon became involved in a scheme that allowed rich young men to pay bribes to avoid military service, as well as reportedly procuring young women for officers. For his involvement, Pickford was nearly dishonorably discharged. Pickford met actress and Ziegfeld girl Olive Thomas at a beach cafe on the Santa Monica Pier. Thomas was just as wild as Pickford. Screenwriter Frances Marion remarked "...I had seen her [Thomas] often at the Pickford home, for she was engaged to Mary's brother, Jack. Two innocent-looking children, they were the gayest, wildest brats who ever stirred the stardust on Broadway. Both were talented, but they were much more interested in playing the roulette of life than in concentrating on their careers." Pickford and Thomas eloped on October 25, 1916 in New Jersey. None of their family was present and their only witness was Thomas Meighan. The couple had no children of their own, though in 1920, they adopted Olive's then-six-year-old nephew when his mother died. Although by most accounts Olive was the love of Pickford's life, the marriage was stormy and filled with highly charged conflict, followed by lavish making up through the exchange of expensive gifts. For many years the Pickfords had intended to vacation together and with their marriage on the rocks, the couple decided to take a second honeymoon. In August 1920, the pair traveled Paris, hoping to combine a vacation with some film preparations. On the night of September 5, 1920, the couple went out for a night of entertainment and partying at the famous bistros in the Montparnasse Quarter of Paris. They returned to their room in the Hôtel Ritz around 3:00 a.m. It was rumored Thomas may have taken cocaine that night, though it was never proven. She was intoxicated and tired, and took a large dose of mercury bichloride. She was taken to the American Hospital in the Paris suburb of Neuilly, where Pickford, together with his former brother-in-law Owen Moore, remained at her side until she succumbed to the poison a few days later. Rumors arose that she had either tried to commit suicide or had been murdered. A police investigation followed, as well as an autopsy, and Thomas's death was ruled accidental. Pickford married two more times. On July 31, 1922, he married Marilyn Miller, a celebrated Broadway dancer and former Ziegfeld girl, at his sister and brother-in-law's famed home Pickfair. By most accounts he was not kind to her and was abusive in the marriage. They separated in 1926 and Miller was granted a French divorce in November 1927. Pickford's final marriage was to Mary Mulhern, age 22 and also a former Ziegfeld girl, whom he married on August 12, 1930. After two years Mulhern left Pickford, claiming he had mistreated her throughout the marriage. She was granted an interlocutory divorce in February 1932 which had yet to be finalized at the time of Pickford's death. In 1932, Pickford visited his sister Mary at Pickfair. According to Mary, he looked ill and emaciated; his clothes were hanging on him as if he were a clothes hanger. Mary Pickford recalled in her autobiography that she felt a wave of premonition when watching her brother leave. As they started down the stairs to the automobile entrance, Jack called back to her, "Don’t come down with me, Mary dear, I can go alone." Mary later wrote that as she stood at the top of the staircase, an inner voice said, "That’s the last time you’ll see Jack". Jack Pickford died at the American Hospital of Paris on January 3, 1933. The cause for his death was listed as "progressive multiple neuritis which attacked all the nerve centers". This was believed due to his alcoholism. Mary Pickford arranged for his body to be returned to Los Angeles, where he was interred in the private Pickford plot at Forest Lawn Memorial Park, Glendale. For his contribution to the motion picture industry, Jack Pickford has a star on the Hollywood Walk of Fame at 1523 Vine Street. ↑ Foster, Charles (2000). Stardust and Shadows: Canadians in Early Hollywood. Dundurn Press Ltd. p. 945. ISBN 1-55002-348-9. ↑ Marion, Frances (1972). Off With Their Heads: A Serio-comic Tale of Hollywood. Macmillan. p. 65. 1 2 3 The Life and Death of Olive Thomas. Taylorology. Arizona State University. ↑ Memories of Olive, Assumption College. ↑ Slide, Anthony (2005). Silent topics: Essays on Undocumented Areas of Silent Film. Scarecrow Press. p. 34. ISBN 0-8108-5016-8. 1 2 "Report Marilyn Miller and Jack Pickford Separated". The Lewiston Daily Sun. January 6, 1926. p. 11. Retrieved June 27, 2014. ↑ "Paris Decree Won By Marilyn Miller". The Milwaukee Sentinel. November 3, 1927. p. 5. Retrieved June 27, 2014. ↑ "Pickford Wedding Is Unmarred". San Jose Evening News. August 13, 1930. p. 4. Retrieved June 27, 2014. ↑ "Jack Pickford Divorced". The Pittsburgh Press. February 27, 1932. p. 1. Retrieved June 27, 2014. ↑ "Jack Pickford, Famous Film Star's Brother Who Also Won Fame in Motion Pictures, Dies". Berkeley Daily Gazette. January 4, 1933. p. 18. Retrieved June 27, 2014. ↑ Pickford, Mary (1955). Sunshine and Shadow. Doubleday. p. 337. ↑ Foster, Charles (2000). Stardust and Shadows: Canadians in Early Hollywood. Dundurn Press Ltd. p. 963. ISBN 1-55002-348-9. ↑ "Hollywood Star Walk: Jack Pickford". latimes.com. Retrieved June 27, 2014. Menefee, David W. Sweet Memories. Dallas: Menefee Publishing, Inc., 2012. Arvidson, Linda. When the Movies Were Young. New York: Dover Publications, Inc., 1969. Menefee, David W. The First Male Stars: Men of the Silent Era. Albany: Bear Manor Media, 2007. Talmadge, Margaret L. The Talmadge Sisters. Philadelphia: J. B. Lippincott Company, 1924. Paris Authorities Investigate Death of Olive Thomas. The New York Times, September 11, 1920. Holmstrom, John. The Moving Picture Boy: An International Encyclopaedia from 1895 to 1995, Norwich, Michael Russell, 1996, pp. 10-11. Wikimedia Commons has media related to Jack Pickford.